[Episcopal News Service] The Episcopal Church ecclesiastical disciplinary panel considering a complaint against Diocese of Los Angeles Bishop J. Jon Bruno has sanctioned the bishop for again trying to sell St. James the Great Episcopal Church. The original case against Bruno involves his unsuccessful 2015 attempt to sell the church in Newport Beach, California, to a condominium developer for $15 million in cash. That effort prompted the members of St. James to bring misconduct allegations against Bruno. The members alleged Bruno violated Church law. The Hearing Panel is still considering whether or how to discipline Bruno. One of the complainants in the case contacted the Hearing Panel earlier this month with what is known as a “colorable” or plausible legal claim that Bruno may have entered into another contract to sell the St. James property, according to the panel’s notice. Bruno then refused to confirm or deny the alleged contract. The Hearing Panel said that if Bruno has tried to sell the church property, or has sold it, before the panel decided the original case against him that conduct is “disruptive, dilatory and otherwise contrary to the integrity of this proceeding.” The same is true of his failure to give the panel the information it asked for about the accusations, the notice said. Such behavior violates the portion of canon law which governs the behavior of clerics who face disciplinary actions (Canon IV.13.9(a) page 151 here). A hearing on the original accusations, including engaging in conduct unbecoming a member of the clergy took place March 28-30 in Pasadena, California. Attorneys representing the Episcopal Church and Bruno filed written closing briefs a month after the hearing ended. The Hearing Panel has not ruled on the initial complaint. St. James was one of four properties that the diocese spent close to $10 million in litigation to recover from disaffiliated Episcopalians who broke with the Church over its policies on women’s ordination and the full inclusion of LGBTQI members in the life of the Church, including ordained ministry. Diocese of Los Angeles Chancellor Richard Zevnik and Vice Chancellor Julie Dean Larsen have asked the panel to dismiss the entire case against Bruno. They have said that a “civil lawsuit, political actions and social media campaign” mounted by members of St. James the Great in Newport Beach were “wrongfully, but successfully and strategically, designed to stop the sale of [the] 40,000-square foot church property” on what is known as Lido Island, a prosperous housing development sporting a yacht club. Because of those violations and because “he shows no sign of recognizing even the possibility of his misconduct,” Coughlan recommended that panel suspend Bruno from ministry for at least a year. Bruno turns 72, the Church’s mandatory retirement age, in late 2018. Incoming Bishop Coadjutor John Taylor, his successor, is scheduled to be ordained and consecrated on July 8. Because none of the previous steps of the Title IV disciplinary process resolved the issue, when the complaints against Bruno got to the point of seating a Hearing Panel, the Episcopal Church replaced St. James as the complainant in the case. Coughlan, representing the Episcopal Church, presented the case to the panel. According to the Title IV process, the Church pays for the costs of the disciplinary process for bishops. Diocese of Southern Virginia Bishop Herman Hollerith IV is president of the Hearing Panel. The panel, appointed by the Disciplinary Board for Bishops from among its members, also includes Rhode Island Bishop Nicholas Knisely, North Dakota Bishop Michael Smith, the Rev. Erik Larsen of Rhode Island and Deborah Stokes of Southern Ohio. Previous ENS coverage is here. Retirement age does not lessen the reality of underhanded and dishonest interactions. Let us not forget that this is the same bishop who knew of uncanonical same gender marriages being performed in his diocese before Lambeth a decade ago. Yet, to be invited to Lambeth he pledged to uphold the long-standing Lambeth Sexuality and Marriage Resolution 1.10 — all the while intending to keep ignoring it. A clear pattern of deceit is shown. If Bishop Bruno is guilty of unpriestly conduct and duplicitous dealings then let right be done regardless of age. If all he gets is a hand slap, a frown, and then a golden parachute then this Church has lost all credibility and has the best preacher union in Christendom. Just fyi, tons of Episcopal bishops were looking the other way on same-gender marriages for quite a long time, as they believed their conscience dictated. doing so hardly establishes a “clear pattern of deceit”. No one “pledged to uphold Lambeth 1.10.” That is what has become known as an alternative fact. This sad situation is sad enough without adding that kind of insult to injury. Seriously. In his letter of invitation, Archbishop Williams said, “with the recommendations of the Windsor Report particularly in mind, I have to reserve the right to withhold or withdraw invitations from bishops whose appointment, actions or manner of life have caused exceptionally serious division or scandal within the Communion.” The Windsor Report called for a moratorium on further acts that create division, ie consecration of another gay bishop, and performing same gender blessings. Bishops were called upon to examine whether they in fact would uphold Windsor, and if so, then they would be invited to participate in the councils of the Church. Bishop Bruno was invited because such an assent was understood, yet he did not uphold The Windsor Report recommendations in his own diocese. “Objections” made by Bishop Bruno’s legal team to the Panel’s request that he disclose whether St. James had been sold, are not evidence that the sale occurred. However, the panel obviously found the objections to be without merit. Since the response was evasive and non-responsive, the Panel concluded that if there was no sale, the Bishop could have simply responded to with a denial rather than a “none of your business” objection. The ENS article does not explain in detail whether the Panel has the power or jurisdiction to order the Bishop not to sell St. James. Legal title to the property is held in the name of the Bishop as a “corp. sole,” which means the Bishop, as long as he is the Bishop, has the legal right to sell the church. The Bishop may well believe, and have been advised by his attorneys, that the Panel will have to confirm his legal authority to sell the property, and that at worst, the Panel can only find that he could have handled the situation “better,” or issue a public reprimand. It will be interesting to see how the Bishop responds to the Panel’s prohibitory order. I care not whether Bishop Bruno is reprimanded for his actions in trying to sell St. James the Great. My sympathies are with the church members who have been locked out of their church for two years now. In his closing brief, Counsel for the loyal members of St. James urged the Panel to find a resolution that would promote unity and reconciliation with the Bishop, which included: “Requiring that St. James promptly be reopened for Episcopal worship under the auspices of an independent member of the diocese, . . . .” If the Bishop has sold the church, then that train may have left the station. If he is deposed as a bishop, then he is not a bishop, and therefore not THE bishop and cannot be corp. sole. I suspect this also applies when under suspension, though I am not an attorney or canonist. The questions here are fundamentally questions of honesty–the Episcopal Church was never designed as an absolute monarchy, where the bishop as CEO can act with absolute impunity–it is perhaps slightly messy to work in a church designed as a constitutional democracy, but it is deeply dishonest to subvert that in the misguided idea that a “strong” “leader” can make decisions that will get the church out of its financial crises. In fact it is this sort of thing that got us into these things. RE: “the Bishop, as long as he is the Bishop, has the legal right to sell the church”. I don’t know about that. If I were purchasing St. James in this secret deal, I would insist upon TEC’s sign off to clear title. After all, the National Church intervened in the original LA lawsuits, and filed suit in other jurisdictions where Bishops took out the Diocese and many member churches. Thus, one can only conclude that according to TEC’s attorneys, it is the ultimate owner of all Episcopal Church property (at least when it comes to assets; TEC undoubtedly would demur if asked to assume liabilities :). That was a brilliant comment, above. The Episcopal Church where I grew up, St. Bartholomew’s Tonawanda NY, where my parents, in-laws and their friends spend their time and hard earned money year after year to improve the church, the church where I was confirmed and married and where my son was baptised, was lost to the arrogant bishop of the Diocese of Western New York even though St. Bartholomews had the largest congregation in all of New York State. The congregation didn’t have the heart to fight the bishop so they simply moved away, to an abandoned synagogue. The Diocese of Western New York sold its very valuable headquarters building for a profit and moved all of the diocesan operations into what was formerly St. Bartholomew’s church. I have imagined the arrogant bishop staring at the beautiful stained glass windows that my parents’ generation donated after several years of saving money for that project. I have imagined the arrogant bishop picking roses in the church’s rose garden donated in the name of my mother-in-law’s best friend. The response in my family was to completely cut off attendance and donations to ANY Episcopal Church. I will never set foot in an Episcopal Church again. When I was in critical condition in a hospital after a train I was riding in crashed, my distraught husband mistakenly told the hospital admissions staff that I was an Episcopalian. When an Episcopal priest showed up in my hospital room 4 days after I almost died, I said “Who will rid me of this meddlesome priest?” and my son threw him out. If today’s Episcopal clergy like Bishop Bruno are sad that attendance at Episcopal Churches throughout the USA is “down” they need to recognize that they brought the church’s decline upon themselves. 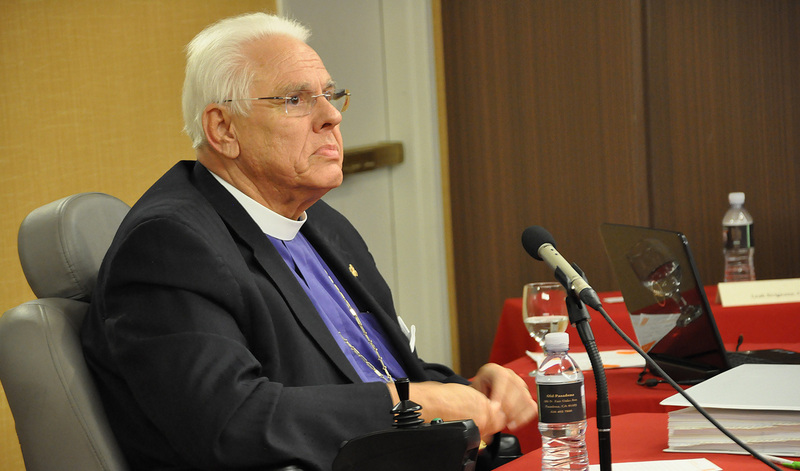 On June 17, the Hearing Panel ordered Bishop Bruno not to sell the Church. Today, the Orange County Register reports that Bishop Bruno secretly sold St. James the Great to Developer Burnham Ward in April. The timeline is interesting. •	The hearing on misconduct charges ended on March 29th, 2017. Counsel for the TEC and members recommended reconciliation and that they be allowed to return to services in the church. •	Bishop Bruno sold the church property in April in a confidential sales contract. •	The attorney for the TEC and Congregation submitted their closing Brief on April 24, 2017. •	Escrow is scheduled to close July 3, 2017. Sounds like Bishop Bruno doesn’t have much respect for the authority of the Hearing Panel or the congregants.. The Post Trial Brief of the TEC attorney is worth reading. The Shepherd, with a fiduciary obligation to his flock, falls victim to the idol of filthy lucre, deposes two congregations from their oceanfront sanctuary, and enters into secret real estate contract to sell said sanctuary while appropriating the contract’s confidentiality clause as a fig leaf to hide his moral nakedness. On Friday, June 23, the Orange County Register reports that Bishop Bruno had already secretly sold St. James the Great to developer Burnham Ward in April. The timeline is interesting. •	The hearing on misconduct charges ended on March 30th, 2017. •	Bishop Bruno sold the church property sometime in April in a confidential sales contract. •	The attorney for the TEC and Congregation submitted their closing Brief on April 24, 2017 which asked to be allowed to return to using the Church as a first step towards reconciliation. How long will the hearing panel exacerbate the situation with out rendering a conclusion ? exorbitant land values have became more valuable than the church’s representation. The actions of Bully Bruno, and other bishops, are a substantial justification for my leaving the Episcopal Church and becoming Old Catholic. TEC is too focused on money and power. I just want to be a good parish priest, meaning, I celebrate Mass, take care of my people, and preach the Gospel by how I live. The report somewhat misrepresents St. James— the present issues are not about when a group in control at the church left the Diocese of Los Angeles in opposition to ordination of women and full inclusion of LGBT persons in the life and ministry of the church. The property and ministry was returned to the diocese– and properly so– and parishioners were working hard to re-establish and continue a ministry through the Diocese that was fully inclusive. The abuse of power issue was in regards to the sale of the property and misrepresentation of facts to the parish, vestry, and clergy. If the property is sold with escrow set to close on July 7– the sale should be challenged as an illegal sale. That is a sale that should not go through for all sorts of reasons. But facts would indicate that St. James– after being returned to the diocese– was on the road to being an inclusive and faithful ministry in the community. Those who oppose full inclusion of women and of LGBT persons in the life of the church should give it up and quit dragging it into every discussion– that ship has sailed, thank God! Get over it! Give witness to a church that celebrates God’s inclusive love for all people. In this case– the issue and damage to the church is the matter of abuse of power. The hierarchical structure of the church is not for the purpose of facilitating lack of transparency in decision making. We have enough alternative facts nationally. We can do without “making up the facts” in the church. Richard Nixon said something like “The people need to know their president isn’t a crook.” In the church the people need to know that the only crook is the one that represents a Shepherd’s crook and servant role represented by the Crozier. A fair resolution of this matter should give witness to the idea that the Episcopal church knows the differences between a shepherd’s tool and a scepter and that abuse of power is neither to be accepted nor tolerated.